When Morgan was sent to her family home in Fond-du-Lac, Wisconsin, a small part of her had hoped that it meant she would finally get the family life she'd always dreamed of. Instead, she was propelled into another world under Lake Winnebago where kids like her are trained to become knights in a millennia-old fight against the Fey. Now, after having been an unwilling key to liberating Carman, the worst she-demon of modern times, Morgan finds herself locked up in jail. All because of what her parents were. But Morgan's done with playing nice and following orders—not that she was ever that good at it—and it's high time she took her own destiny into her own hands. Before the knights execute her, and certainly before Carman destroys the whole world in her rage. Site design © & maintenance by xuni.com. 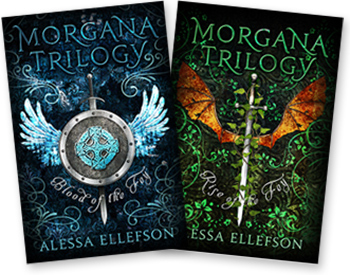 All content © 2013-2019, Alessa Ellefson.